This article is about the limited 4★ Frankenstein. For the 4★ , see Frankenstein. 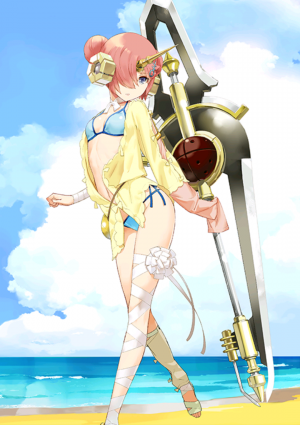 Increases NP gain for 3 turns. Cannot use this skill without at least 10% Gauge. Cannot use this skill without at least 501 HP. Deal powerful damage to one enemy. 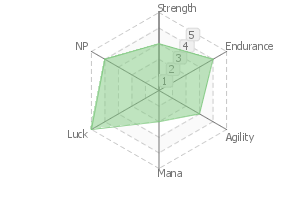 Increases party's Quick performance by 10% and NP gain by 10% while she is on the field. The arrival of the summer season!! 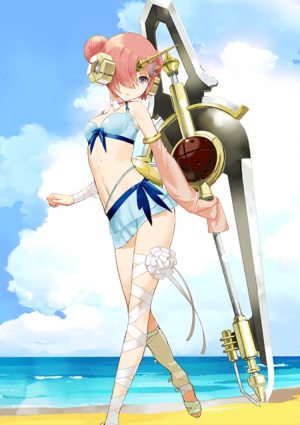 The bad-with-summer cyborg Fran-chan, changes into a swimsuit to keep cool, and enters the race! Her partners are a suspicious old man of around-fifty and the trans-morphed Giant Robo-Babbage. It's like the Great Summer Blockbuster Film! Old Man of around fifty: "Our Fran is the number one cutest in the world." 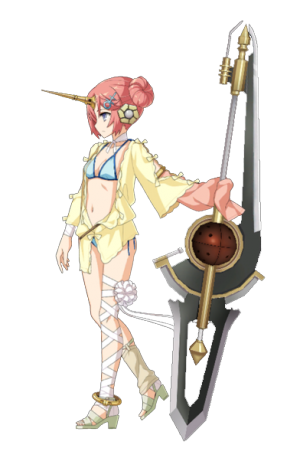 Saber Fran, made into a sluggard because of the summer heat. But when the moment comes where she starts to easily go berserk, hahaha whichever it is, it's truly a problematic matter hahaha, her image is like a "languid, large dog affected by the summer heat", and so the old man of around-fifty supports her rampage. Only Professor Babbage is reliable! Steam, Electricity, Evil Schemes, with these three combined this team has no weaknesses! I think! Also, because her Saint Graph has been tampered with, she has somehow become a Saber. 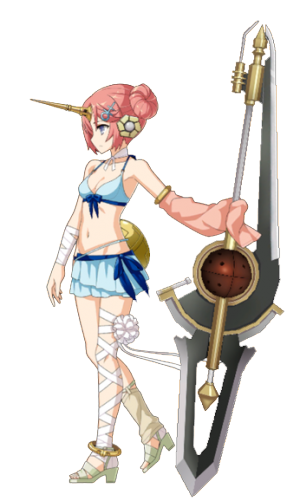 What a surprise, Fran-chan is able to ride in Babbage's Locomotive form. That posture, it's very much just like Today's Dog. The summer's galvanism is somewhat unique. To be more specific, because of receiving backup from Babbage, the steam engine also generates power. Demerits: Hot, sluggish. 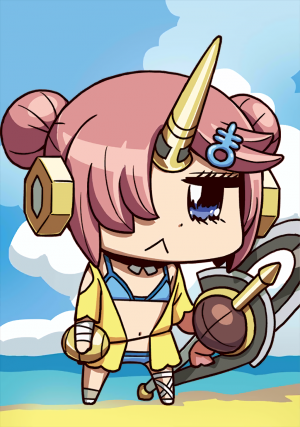 If Fran-chan feels just a little hot, she quickly declines into a bad mood of ennui and lethargy. Very much like a large dog that has lost to the summer heat. Because it's too tiresome to Overload. Quick-loaded energy from vigorously swinging the Bridal Blade. After which, she jumps and pierces. That colossal cluster of electrical energy, if carelessly struck, has a risk of affecting other surfaces as well. 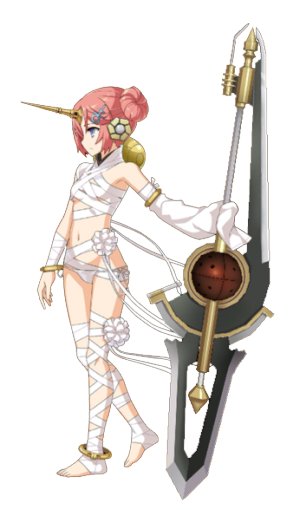 Because it's summer, even the normally diligent Fran-chan, shows the Master her laa~zy side. Occupying the Master's bed, and idling listlessly while indulging in the air-conditioning. The kind of level where you'd upload a photo on social media with the caption of 'When your pet doesn't want to move away from your bed, what should I do? ', while grinding your teeth in frustration as you watch over the innocent Servant who wants wickedly to occupy your bed.